While we were on our overseas tour in 1970, we visited Holland. In fact, we landed in Rotterdam (now one of the biggest harbours in the world) on 10 May 1970. We were met at the boat by Auntie Co’s sister, Truus and Co’s twin sister, Rie. While in Holland we visited Germany and Belgium and a lot of Co’s relatives. Until about the middle of June we stayed with Nick and Truus at Midwood. Staying with relatives is often a tricky affair! Nevertheless, we were able to repay them in a most unexpected way. But it was one of the things in my lifetime that I have been able to achieve. We handed them our Wolesley 1500. When we left England they (Nick and Truss) drove it back to Holland. First on to the boat at Dover then through France, Belgium and home to north Holland. The Wolesley is still giving them good service today. Co was often not at all well. And having been a fortnight with her sister, Rie, I left on the plane for England to seek out the land and secure accommodation. I first went to see my brother, Lionel, at West Ewell and put up at the Epsom Downs’ Hotel. After touring the country, I found accommodation within easy reach of London practically impossible to obtain. So one day I took the train to Deal (where I first started school) and that solved all our problems. We booked up there for the first week in July and kept up the booking until the day we sailed from Southampton on 30 September 1970. The town of Deal had not altered so very much and the one mile promenade was still there. The beach is mostly pebbles and not popular with a lot of seaside enthusiasts who like the sand. But to me Deal is a wonderful place. The people who we stayed with and whom we met still correspond with us. We had an apartment with a big bow window on the First Floor overlooking Deal Castle and the sea. Walmer Castle, two miles further on, was then occupied by Mr Robert Menzies, who had been created Warden of the Zinc Ports. As you know, Robert Menzies was formerly Prime Minister of Australia. Walmer always brings back happy memories to Co and myself because it was there that we picked up the Wolesley 1500, which was then nine years old. In Holland and the Continent generally they drive on the right side of the road. So while in Holland we did not buy a vehicle. Apart from that cars were very high priced. But as soon as I got to England I began looking around for a car. But it was not until 16 July 1970 when Co came back with me from Holland that we got the Wolesley. It was our intention while in England to look up as many people as possible. Nevertheless, owing to the fact that we had Nick and Truus over with us for two weeks and Co was never very well, it was not until 26 August 1970 that we started for the North. In the meantime we had a lovely time in Kent and drove everywhere. We met our cousin, John Graham at Whitstable where he was boarding with Kaye’s parents (his girlfriend). Previous to this he had rang up at Deal and came to see us one evening. In case I have not told you before, my brother Pat (your Great Uncle) and his wife, Phyliss, had no children and John was adopted. As is usual in such circumstances they then had a child of their own, your Uncle Paddy whom I have not met. He was touring Morocco when we were in England. Your cousin, John is a very nice boy. Co and I tried to persuade him to come to Australia. But he had foolishly made his father-in-law power of attorney. He together with his brother and uncle inherited all of Aunt Hazel’s estate of about £17,000. After leaving Deal we stayed two nights with my brother Lionel and his wife, Trixie, at 96 Green Lanes, West Ewell, Surrey (Lionel passed on last November 1973). Trixie wrote in February this year. After travelling through Wales we visited my father and mother’s graves at Sheriff Hales, Shifnal, Shropshire and Mr Balwich, who was a great help to us. We have photographs of the grave at Sheriff Hales. Our neighbour, Mr Fowler, was still alive and 94 years of age. When we visited him at Shifnal he was living with his son-in-law who was not pleased to see us at all although we came all the way from Australia. We next visited your Great Uncle, Eric (my only brother now living) at 10 Ashtree Drive, Little Keaton, Wirral, Cheshire. As he and his wife, Selina, had no accommodation we had to drive 50 miles to see him. We were then staying near Mold in North Wales where we met our old neighbours from Mount Helena, Mrs Majorie Woods. Eric and Selina also have no children. The district where Eric lives is particularly bad for obtaining any sort of accommodation but in North Wales we stayed at a lovely place called The Woodlands run by Mrs Fadden and her husband – very nice people. A very old friend of the Graham family, Miss Lena Forbes, was living in Belfast, Northern Ireland and we hoped to see her when we went for trip to Europe. In fact she sent us brochures of all the tourist places. Unfortunately, she passed on in 1968. After that her friend, Charlotte Irvine, wrote to us and we met her in Belfast at 52 Summerton Park Road. After driving off the boat, “The Duke of Argyle”, we had breakfast with Charlotte then drove to Larne to book our trip to Stranraer in Scotland for a week’s time. It was wonderful being able to drive on and off the boat on both occasions. I have a separate record of our whole trip so will not bore you with the details here. After leaving Southampton on “The Himalaya”, we travelled via the Panama Canal and across the Pacific to Australia. When we called in at Vancouver we were met by Bill and Muriel Thorne who drove us around to see all of the sights and took us to lunch at a lovely upstairs restaurant overlooking the harbour. Your mother can explain to you who these people are perhaps better than I can. Anyway, you Grandmother, Nancy, and her sister, Janette, got a note from the Police Department saying that someone in Vancouver, Canada was looking for the descendants of William Grieve, formerly of Glasgow, who were now living in Australia. This someone turned out to be Mrs Jean Black (Aunt Jean) in her letters to Nancy. She often spoke of her sister, Mrs Thorne. We met this lady then 93 years of age while in Vancouver. Bill Thorne is her son and now their daughter has just got married and lives in Edmonton. While in Scotland we tried to contact some of your grandmother’s relatives but were unsuccessful. Your mother has a bible that once belonged to the Grieve Family and has the birthdays in it of Mr William Grieve (Nancy’s father) and his older relatives. Therefore, the book must be at least one hundred years old. Now I will tell you something about my doings since I took up the Mount Helena property. When you take up new land in Western Australia or any other country it is most beneficial to have a job as well unless you have a big banking account in which you would not need to take up new land. 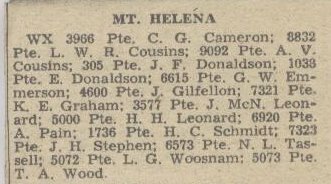 There was never any work in the Mount Helena district after the Timber Mill closed down and that was long before my time. So for years I worked in the Kalamunda District and used to come over here on weekends and holidays. After working several years at Mrs Houghton’s and Joe Gray’s of Bickley Valley I eventually got a better job at Wilson and John’s Nursery at Carmel and I was there from 1936 to 1940. 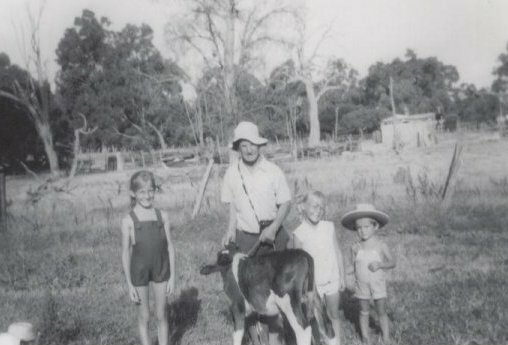 Figure 41: Keighley with his three grandchildren at Algate Farm, Mount Helena. This is perhaps one of the last photographs of Keighley with his grandchildren, Stephanie (left), Kellie (middle right) and Grant (right) before he passed away on 11 December 1974. When the war started in September 1939 a lot of young men in Western Australia volunteered for service. By February 1940 so many had transferred from the militia units to the A.I.F. [Australian Imperial Force] that the local branch of the Cameron Highlanders were calling for volunteers for their eight week annual camp at Northam. Well, I thought what a wonderful chance of a good holiday and eight weeks army training at the same time. So I went to the Drill Hall in William Street, Perth and applied for examination and enlistment. Well, I got the shock of my life when I was told that I was unsuitable. They wanted men from 21-35 years of age (I was then thirty-five) and five foot and nine inches in height. I was then five foot two-and-a-half inches! So that was that. Figure 42: A photograph entitled “Sandgroping in Cirenaica”, 1941. The Australian soldier pictured is building a desert home and closely resembles Keighley. The photograph was published for the Military History and Information Section of the Australian Imperial Force (AIF) in the Middle East in 1941. Interestingly, the title, “Sandgroping in Cirenaica” is significant. A “Sandgroper” is a colloquial term for a West Australian. Only a little over two months later I was working at Karragullen picking apples. On 29 April 1940, I got a telegram asking me to report for examination and enlistment immediately (I still have the telegram somewhere). I was no longer interested. By 6 June 1940, France had fallen and the Allies were hard pressed. Here in Australia the Government were calling for recruits from men 21-40 years to join the A.I.F. for overseas service. So, George Emmerson and myself went down to Perth to join up. I passed the medical examination but they found I had one varicose vein and I was told to get it treated and return in two weeks’ time. I was called up on 6 August 1940 about two weeks later. 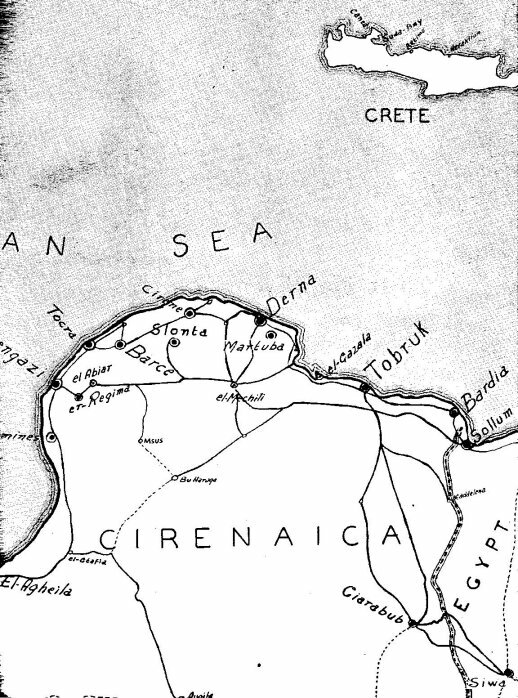 Figure 43: A Map of Cirenaica, Libya, 1941. Cirenaica is largely a desert region of Libya and was an important part of the North Africa Campaign in World War Two between the Allies and the Nazis who were led by the “Desert Fox”, General Erwin Rommel, and his Afrika Corps. Tobruk was place of great significance for British and Australian soldiers in the North Africa Campaign. 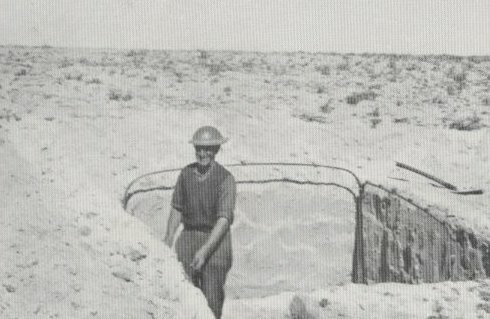 Due to the trench warfare required in this inhospitable desert region, the Australian diggers and their British counterparts were nicknamed the “Rats of Tobruk”. George Emmerson and [I] were never in the same unit. Most of the battalions and regiments were formed in the eastern states and the remainder picked up at Fremantle when the boats passed through. With the result that we were in the training camp at Northam for months and months. At the time, of course, I was single, had no family in Australia and very few friends, but in the Army you soon make friends. On that day in August 1940 when I went over the railway bridge at Claremont to report for enlistment at the Showgrounds there were two fellows just in front of me, each with a little bag. I thought they were off to work but I was wrong. They, too, were joining up. Fred Jackman, WX7319; Les Poyser, WX7320; and myself, Keith Graham, WX 7321. We used to Home Leave once a fortnight and the other week visitors were allowed in camp on a Sunday. I hope to find photographs of those days to place on the opposite page. Les Poyser never came back. His boat was sunk off the Philippines and as there was strict censorship during the war I never heard the particulars.